WATERTOWN — In the testosterone-soaked plays of David Mamet, word games have often been the instruments for mind games. The schemers and sleazeballs who populate works like “Sexual Perversity in Chicago,’’ “American Buffalo,’’ “Glengarry Glen Ross,’’ and “Speed-the-Plow’’ are intent on manipulating others — and just as intent on concealing those manipulations by means of elaborately profane (and frequently funny) circumlocutions. If they just keep talking, they seem to feel, they will eventually get their way. 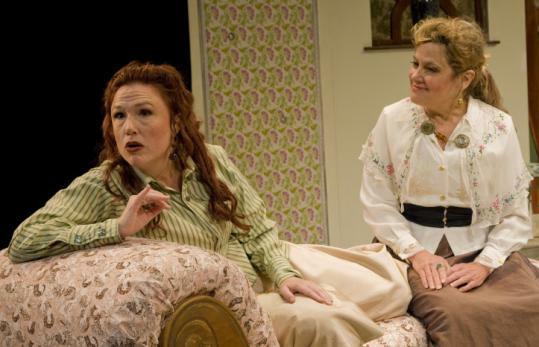 On one level, “Boston Marriage,’’ now at New Repertory Theatre in a production directed by David Zoffoli, is the least Mamet-esque work the playwright has ever written, from the gender of its three characters (women) to its setting (a Victorian-era drawing room) to its diction (arch, mannered, Wildean). But the characters in “Boston Marriage’’ do share with their less genteel cousins in Mamet Country a belief in the sheer power of language as a means of mastery over others. What they do not share, even though New Rep showcases several solid performances and some entertaining flashes of Mamet’s scabrous wit, is a consistently compelling reason to watch and listen to them. The title is drawn from a turn-of-the-century term used to describe unmarried women who lived together and was often a euphemism for lesbian lovers. When we first see Anna (Debra Wise) and Claire (Jennie Israel) in the former’s drawing room, there is a barbed formality to their exchanges that suggests a lot of shared history has given way to an awkward present. Though Anna is the mistress of a rich man and has the expensive emerald necklace to prove it, she is plainly still in love with Claire. But Claire is enamored of a young woman. In fact, she is cheekily seeking to arrange a tryst with her new paramour at, of all places, Anna’s house. When the young woman arrives at the house (this action occurs offstage), unforeseen complications arise. Further complications, and comic relief, are generated by Catherine (Melissa Baroni), a perpetually flustered Scottish maid who doesn’t so much enter rooms as totter into them. In a running gag that generates some of the play’s most amusing moments, Anna assumes Catherine is Irish and, to Catherine’s growing fury, cannot be dissuaded from that assumption. Nor does Catherine much like the fact that Anna keeps calling her “Nora’’ and “Molly’’ while heaping insults on her tousled head and on her alleged Irish heritage. “Boston Marriage’’ premiered in 1999 at the Hasty Pudding Theatre in a production by the American Repertory Theater that was directed by the playwright himself and starred Rebecca Pidgeon, Mamet’s wife, and Felicity Huffman (who later found TV fame with “Desperate Housewives’’). Back then, it was seen as Mamet’s answer to criticism that he could not write for women. Israel and Wise, practiced veterans that they are, handle the abrupt tonal shifts of “Boston Marriage’’ with aplomb and even relish. Delivering their lines in a purposefully stylized manner, they have some snarky fun with the repartee between Claire and Anna, and with the mean streaks that neither woman bothers to try to hide. Baroni, as the maid, makes an amusing foil for the pair, though she is more convincing when Catherine is resentful, spiteful, or angry than when she is tearfully distraught. The visually sumptuous environment created by set designer Janie E. Howland — with its muted grays and greens, tastefully patterned curtains, and a pair of inviting divans — creates a tranquil mood that provides a striking contrast with the sharp verbal exchanges. Costume designer Rafael Jaen also does exemplary work, especially in devising an outfit for Claire — calf-high boots, tight-fitting jacket — that mirrors her crisp demeanor. Yet it is invariably the ear, not the eye, that feels satisfyingly over-stimulated, even engorged, at the end of the most trenchant Mamet plays, and that feeling is lacking here. Almost anything the man writes is worth checking out, and “Boston Marriage’’ is no exception. But it is more interesting for what it says about Mamet’s need to challenge himself at a certain point in his career than for its intrinsic quality. And when that remarkable career is over, it’s hard to envision “Boston Marriage’’ being much more than a footnote. Sets, Janie E. Howland. Lights, Deb Sullivan. Costumes, Rafael Jaen. Sound, Joel Abbott.